This series was inspired by the posters of Russian constructivist, Alexander Rodchenko and reflect Floyd’s interests in ideas of community and Utopian thinking. Each work relates to a kind of collective organisation – from beekeeping to Australia’s first Utopian community, Herrnhut Commune, established in Victoria in 1852. Emily Floyd is inspired by typography and graphic design – as a consequence much of her work has a strong graphic sensibility well-suited to printmaking. 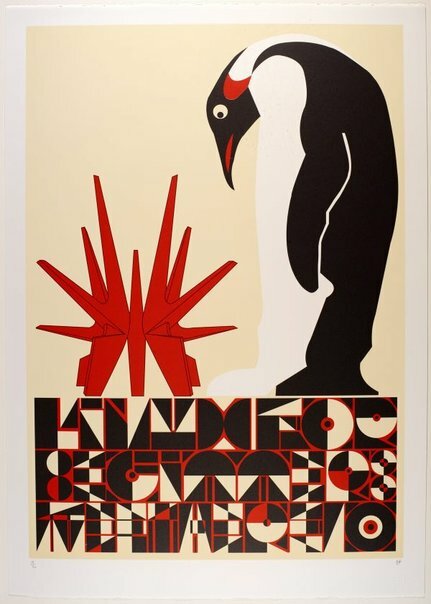 She often invents her own fonts in the spirit of avant- garde experimental typography as in Dada, Bauhaus and Constructivism – in these prints the title is included in text that serves as a pictorial device within the image. The prints were commissioned by the Australian Print Workshop, Melbourne in 2012, as part of a series of commissions and exhibitions (‘Catalyst: new and selected limited edition prints by six leading Australian artists’) to mark the workshop’s 30th anniversary. Working with senior master printer Martin King, Floyd produced this series of four colour lithographs. Signed with initials l.r. corner, pencil "EF". Not dated. unknown author., The Age , Emily Floyd in 'The best of art' section, the (Melbourne) magazine, Melbourne, Jun 2012.